Forman Music society has constituted efforts to promote music among FCC’s students. The initiative of delivering music lectures has been taken under consideration this year. 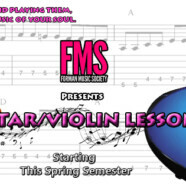 Last Wednesday, FMS conducted first lecture on Guitar and Violin classes which was responded well by enthusiastic students of FCC seeking to grasp musical skills. After the large number of requests received, FMS has decided to extend the deadline for the registration for music classes till 4 February 2014.